Historians say Halloween began with the Irish and we at the Irish Cultural Centre want to celebrate that great part of Irish history. Halloween from around the world describes how Halloween began with the Celts farmers thousands of years ago. “They knew that the sun helped make their crops grow, so when autumn came the sun began to fade and they believed that the sun would be winter’s prisoner for six months. They were worried that the sun would not return so to make sure it did they held a festival on October 31. During which, they asked the sun to return safely in the summer. All the cooking fires were put out and a huge bonfire was lit on the hillside. Here they prayed the sun would shine brightly after winter was over. The next morning they would return to the hillside take a piece of the burning wood from the remains of the bonfire and light new fires so as to bring good luck. Feasts were held over the new fires and people would dress up in costumes made out of animal skins. It was believed these costumes would protect people from bad luck. This is how Hallowe’en is said to have begun and is still celebrated today. 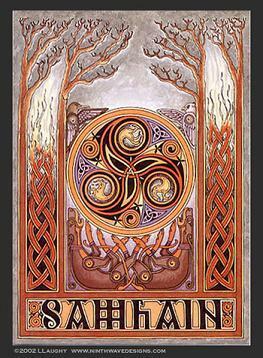 The Celts referred to Halloween as the Samhain Festival. It was during this time that you would lead your livestock home from summer pastures to the winter shelters. Samhain Eve was a time when the veil between the worlds of the living and the dead grew thinner, and ghosts ventured toward the warmth if people’s homes and hearths. On the Eve the Celts built bonfires in memory of their departed ancestors and left food and drink on their tables overnight for eating by the ghosts. The Irish Cultural Centre is going all out for Halloween this year with two events on Sunday, October 27th . Beginning at 12pm is ICC’s first Halloween Irish 5k! Get your costumes on and run like crazy for Halloween on this flat as a pancake course. Following the road race will be a fantastic post race party with drinks, food and live music. In the afternoon we are celebrating Halloween with the little ones with our first Little Celts Halloween celebration. Halloween began with the Celts, and we’re bringing back their Irish traditions for the whole family to enjoy. On this spooky Irish holiday, we’ll have a costume competition, Halloween games, pumpkin carving and we can’t have Halloween without Barnbrack –traditional Halloween fruit bread in Ireland. This year for the first time we will be launching the biggest and scariest Halloween Scavenger hunt! The large grounds of the ICC will be covered with spooky, hidden treasures. Hunt begins at 3pm with prizes for all. Pub will be open for fall ales or a ‘Halloween’ pint so come on down--there is plenty for the whole family to enjoy. For more information please visit www.IrishCulture.org.